NASA Uses Students To Develop Virtual Reality Programs Scientists at NASA's Goddard Spaceflight Center are hoping to use virtual reality technology to study space, and Earth, without leaving their offices. Talented high school students are helping. 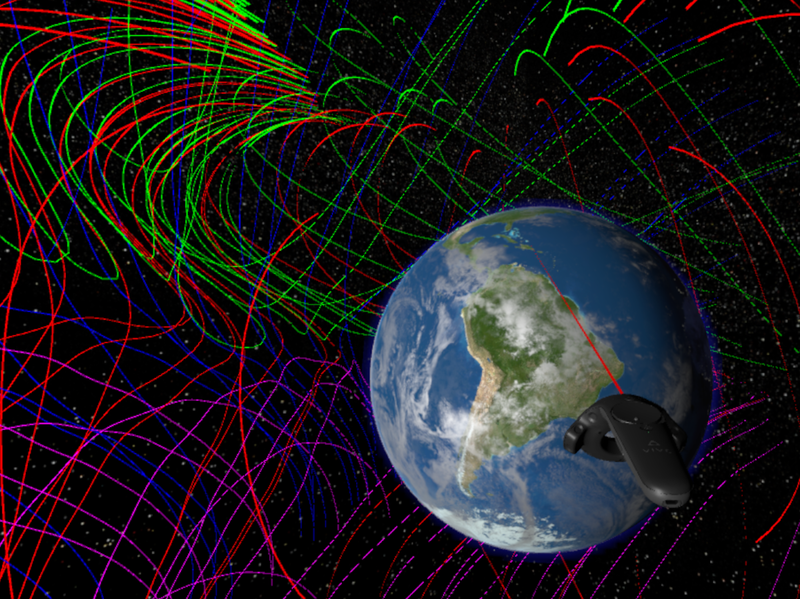 A virtual reality program developed by NASA could help scientists visualize the magnetic fields around the earth. NASA has big hopes for virtual reality technology. The agency is developing a suite of virtual reality environments at Goddard Spaceflight Center in Maryland, that could be used for everything from geological research to repairing orbiting satellites. One displays fiery ejections from the Sun. In another, scientists can watch magnetic fields pulse around the earth. A virtual rendering of an ancient lava tube in Idaho makes scientists feel like they're standing at the bottom of an actual cave. "I think, and I hope, this can be extremely useful for NASA scientists," explains NASA engineer Thomas Grubb, who manages the program. The goal, he says, is to scale up the use of virtual reality technology in NASA labs, and go beyond public applications like the Mars immersion program that allows users to explore the Martian surface. For example, NASA volcanologist Brent Garry is hoping that virtual visits to a rock formation in Idaho can help him plan research trips in real life. That same VR environment also allows users to measure distances and leave notes in the landscape. "You know, it's cheaper to have people go to a lava tube in VR than to actually fly them out there for two weeks," says Grubb. Another application in development could allow technicians repair satellites. People on earth could watch in real time as they manipulate actual tools in space. If the repairs are successful, satellites that would have died when their batteries did could keep working instead. "All of these things can save a lot of money or time, or just enable new things," says Grubb. And Grubb has stumbled upon a new talent source to help develop the pilot programs: young students, some of them still in high school. "I went into this [thinking] 'I'll take a couple interns or whatever,'" he says, imagining he'd get a single college student to help with some coding. But he says when he posted the job, "I got all these amazing students coming back. And I was like 'I want more than this.' I ended up with five [interns]." One of them was high school senior Jackson Ames. In addition to taking some computer science classes in school, Ames plays video games. "A lot of the games require strategy and teamwork. One of my favorites is called 'Onward'," he explains. Onward is a war simulation game. It's supposed to make players feel like they're soldiers fighting a battle. You play with a VR headset covering your eyes and a controller in each hand. "It's much more realistic than anything else," says Ames. "It adds a whole new layer." Ames plays the game many times a week, which gives him an intuitive sense of what works, and what doesn't, in VR. Young people also bring a certain ease with learning new technologies. Stewy Slocum, a 17-year-old college freshman who worked on the lava tube simulation, says video games got him interested in virtual reality programming too. But he's not that into gaming anymore — that was more of a high school thing — and he hadn't had much experience with VR technology before he arrived at NASA. Still, he quickly learned how to use the VR system he was working with. That is often not the case for some more experienced researchers. "There were definitely some older people who tried [the virtual reality system] and struggled at first, because they're not used to having all ten fingers working at once," says Garry. "They're like 'Am I going to fall? Am I going to trip on something?" Once people navigate the initial learning curve, exploring virtual reality can go from alarming to fun pretty quickly. The growing popularity of virtual reality systems like the HTC Vibe and Oculus Rift for video games and education has made virtual reality techology more mainstream, but that can actually act as an obstacle to using VR technology for research, Grubb says. "People think 'This is too cool and too much fun. How can this be work? '," he laughs. "We're trying to show scientists that, 'Hey, this technology has a lot to offer.'"